Turkey's army said it clashed with Islamic State (IS) militants over the border in Syria, leaving one soldier and 23 militants dead, as Ankara stepped up an operation to clear fighters from the war-torn zone. Three other Turkish soldiers were wounded in the encounter near the Syrian village of Ziyara over the past 24 hours, part of Ankara's "Euphrates Shield" offensive, the military added on Wednesday. 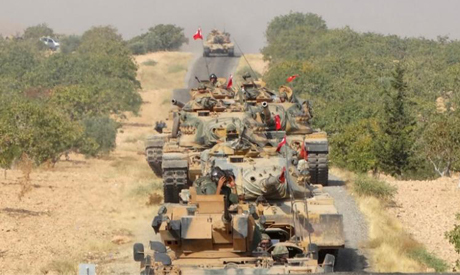 Turkey's entry into Syria has raised fears of a further escalation in an increasingly regional conflict. But Ankara says its efforts to cleanse its border region of IS militants are legitimate under international law as self-defense after months of rocket attacks and bombings in cities along the boundary. President Tayyip Erdogan has also made it clear that Turkish forces are in Syria to prevent the Syrian Kurdish militia, which is backed by the United States to fight IS, from expanding areas under its control. Two Syrian rebel fighters backed by Turkey died in other clashes with IS along the boundary, the Turkish military statement said. The Ankara-backed rebels had seized control of around 980 square km (378 square miles) of territory since Euphrates Shield began on Aug. 24, it added. Separately, U.S.-led coalition warplanes launched nine air strikes on IS targets in northern Syria, killing five further militants, the military said in its daily summary of the Syrian operation.